As eco-conscious consumers, making our clothes last longer is one of the first steps to building a sustainable closet. How we wash our clothes plays a huge part in not only their lifespan but also on our carbon footprint. 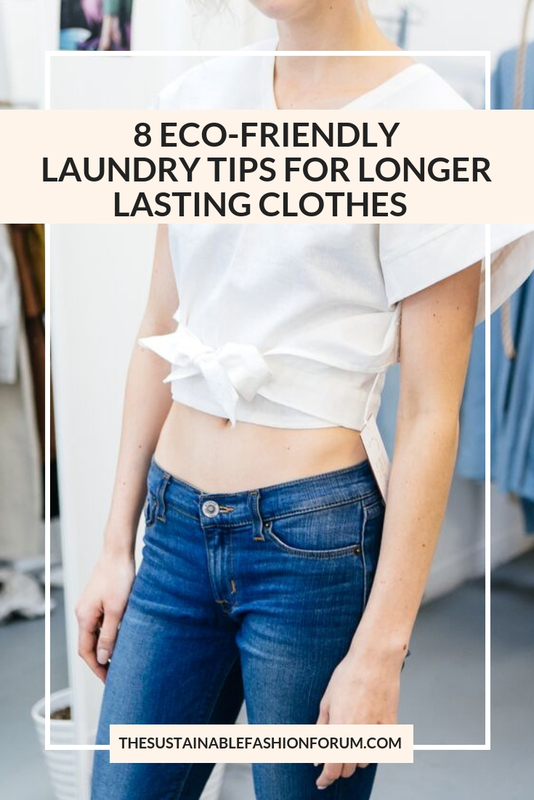 Today we’re sharing 8 eco-friendly laundry tips to make your clothes last longer and reduce your impact on the planet. It’s estimated that almost 90 percent of the energy used when washing clothes goes to heating water. Use cold water to wash your clothes where you can and reduce the energy needed for heating the water. Adding a half cup of white vinegar to the rinse cycle works to kill gems, whiten whites and helps get rid of odors. White vinegar also naturally makes your clothes soft and fluffy and is a great alternative for dryer sheets which contain synthetic fragrances and other chemicals. Use natural detergents and products that are free of chlorine bleach, synthetic fragrance, dyes, and optical brighteners. Natural detergents are usually plant (not petroleum) based and contain biodegradable surfactants, and tend to be specifically formulated to perform well in cold water. Have you ever spilled guac on your shirt and tried to rub it clean only to end up making the stain 10x worse than it was originally? Welcome to my life. Rubbing will most likely make your stain worse and possibly wear away the fabric. Instead, gently dab the stain with cleaner and always use a white cloth so that colors can’t transfer. One natural option to get rid of stains is to toss the item into a big pot of water with a few lemon slices and bring to a boil for a few minutes and/or let soak overnight. When using the dryer make sure to clean the lint trap before starting your dry cycle. Dryer lint build-up can restrict air flow and cause your clothes to take longer to dry — and thus use more energy. Do you have any eco laundry tips that help keep your clothes in good shape? Join the conversation and comment below! 6 easy tips for building an eco-closet.